As a Realtor who has been successfully completing short sales over the last four years I get to see quite a bit of the inner workings of a short sale transaction. In many of the articles I have written about short sales, I have expounded on how important it is for a seller to have a Realtor representing them that understands the process completely. From a buyers perspective it is pretty easy to understand the frustrations of some short sale transactions most notably the extra time it usually takes to get one approved compared to a traditional sale. The short sale completion time often is due to the particular lender involved and the complexity of the short sale. Things like the number of lien holders, liens against the property and private mortgage insurance can all be factors in whether a short sale will take extra time. When a Realtor is the cause of a short sale not being approved there is no excuse! In fact this is why there will be short sale lawsuits against Realtors who are clueless. I want to share my story from a buyer’s perspective on a short sale that I was interested in purchasing for myself and how things have unfolded over the last few weeks. Unfortunately, I ran into an agent that doesn’t understand short sales! Believe me I would love to broadcast who this agent is just so anyone thinking of short selling their property would never consider using them. In all likelihood this agent will be the direct cause of why this owner gets foreclosed on. It is a short sale botch job beyond belief. Without giving away too many details this property was not located in Massachusetts. For me it would have been a nice vacation spot where I could get away when needed. Let me 1st start off my story by explaining to you that the property was listed as an approved short sale for $79,900. If you are not familiar with short sales the vast majority of them are NOT approved by the lender prior to a buyer making an offer on one. Usually a buyer makes an offer and you wait for the lender to either approve, counter or reject the offer. The property I was interested in purchasing was marketed and advertised as an APPROVED short sale in MLS. Well guess what folks it was NOT an APPROVED short sale. The Realtor marketing the property clearly was misrepresenting the property in order to make it more attractive to an interested buyer. A clear violation of the code of ethics! This fact alone could get a Realtor in deep #$%@ but I am only starting my sad story. I got past the fact that the short sale was not approved and made an offer anyways. I should explain that this property is a condo and is located in a neighborhood where all the units are virtually identical aside from differences in updates, amenities, and whether it has a water view or not. The last sold comparable property in the neighborhood closed 9 months ago for around $100,000. This becomes relevant because over the last 9 months property values have still been declining in this area. At the moment there is a bank owned unit for $59,900 that is under agreement in better shape, a short sale that has been on the market for close to a year at $85,000 and another that was recently taken off the market for $75,000 that was also on for close to a year. Clearly the value of the property is not the same as it was when the appraisal on this unit was done by the lender. I made a very respectable offer on the property which my agent submitted to the listing agent. The listing agent told my agent that my offer would not fly and that the lender needed $84,200. Really??? I asked why it was being advertised at $79,900 and never got an answer. The listing agent did submit the offer to the lender and used what is called a request for variance under the HAFA short sale program. The request for variance is used to get a lender to accept something less than what they are required to accept under the guidelines of the HAFA short sale program based on the appraisal they have. Writing this to the lender is wrong on so many levels! 1st of all a Realtor does not work for a lender in a short sale!! The listing agent works for the seller and should be doing everything possible to get the property SOLD. Does it sound like the Realtor is making a good case for my offer being something they should look at or I am just a dumb buyer who is trying to steal the property? Needless to say my offer was rejected and the lender said they would not accept less than $84,200. The listing agent then raised the price in MLS to $84,200 after having been on the market for months as an approved short sale at $79,900. How damaging do you think that is for the seller! Folks in a short sale the only consideration from a seller’s perspective is getting the property sold and the short sale debt removed. The seller should not care if the property sells for X or Y as long as the debt is removed which they are granted under the HAFA program. It is painstakingly clear that the agent has probably never done a short sale before and does not know anything about short sale debt removal. You may be thinking how do I even know the listing agent wrote this to the lender? This is where it gets even worse. The listing agent passed along to my agent private information that should have never been shared with anyone. A date in which foreclosure proceedings could be commenced against the seller. The minimum amount the lender would accept for the property. The name and phone number of the short sale negotiator. The name of the HUD officer who signed the rejection of my offer. I already Google his name and could contact him directly as well. Besides completely botching everything you could possibly do from a short sale perspective and maintaining your fiduciary responsibility to the seller, the Realtor does not even understand appraisals 101. The listing agent insists that only closed properties are data that the lender should be looking at. REALLY??? You have properties on the market that are not sold that are listed 20-25% under what the last unit sold for 9 months ago!! Please go back to Real Estate school. Ask an appraiser if they use current listings in their analysis….stop acting like the biggest dope going. I am paying cash so it doesn’t matter but if I was getting a loan my lender would certainly take the fact that there are units on the market that haven’t sold sitting there at these prices. Why do I bring the appraisal aspect up? The lender has an appraisal that is 9 months old for $90,000. If a new appraisal was ordered the lender more than likely would change their position. I would get my vacation spot, the listing and selling agent would get paid, the lender would not own another property and most importantly the seller would avoid foreclosure. The listing agent won’t ask the lender to get a new appraisal. I have also asked if my attorney could speak to the negotiator directly. I have been rebuffed on all accounts. If the listing agent had submitted the current listings and made a good argument to the lender for my offer being accepted I would not even be writing this article. Explain this situation to the listing agents broker of record and make clear that their agent is a walking lawsuit waiting to happen? Try and call the negotiator directly and ask for a new appraisal? Make a copy of this article and mail it to the seller? The seller has a ready willing and able cash buyer who can close immediately. A foreclosure is a costly situation that the lender could avoid. This would be a win-win for all involved. A new appraisal would make this a simple transaction. After going through it myself it is even more clear why every seller considering a short sale should be working with a PRO! If you are thinking of purchasing a short sale here are some short sale questions to ask the listing agent to see what the probability you will ever end up at the closing table. 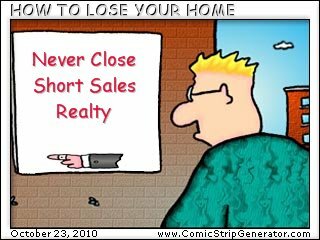 Nationally less than 30% of all short sales close! In many cases this can be traced back to a Realtor who has no idea what they were doing. *** Update – after a few months I finally was able to convince the listing agent to get the lender to order a new appraisal. The appraisal was done and came inline with what I was offering. The lender accepted my offer and we closed. Without my knowledge of short sales this property probably never would have closed and the seller would have ended up in foreclosure. All because the Realtor lacked the proper understanding of how short sales work. The scary part is this agent advertise themselves as a short sale expert. About the author: The above Real Estate information on short sale Realtor mistakes was provided by Bill Gassett, a Nationally recognized leader in his field. Bill can be reached via email at billgassett@remaxexec.com or by phone at 508-435-5356. Bill has helped people move in and out of many Metrowest towns for the last 25+ Years. As someone who exclusively deals in short sales, I share your frustration. I take issue with anyone listing a property as short sale approved. While it may be true that the lender is willing to accept a short sale, that is the case with any property. The only requirement is that the homeowner experience a financial hardship, and lenders barely scrutinize hardship letters. Thus, if someone is listing the property as short sale approved, they are arguably misrepresenting the property and are doing it for no other reason than to call attention to their listing. Even if a short sale offer had previously been “approved”, there is a reason that the short sale did not go through. If the agent receives a subsequent offer, they still need to submit a short sale package to the lender regardless of whether a previous offer was “approved”. With regard to the property that you were considering purchasing for yourself, have you ever thought of using an independent third party negotiator? I won’t shamelessly plug my own company, but many of these issues can be avoided by using an independent third party negotiator. Furthermore, by using a third party negotiator, Realtors will limit the likelihood that they will be involved in a short sale lawsuit as well as ensure that they are in compliance with the FTC’s recent Mortgage Assistance Relief Services (MARS) ruling which could result in fines of $11,000 per occurrence and may even prohibit Realtors from negotiating their own short sales. Short sales are the fastest growing sector of the real estate industry and it is important that Realtors understand the legal and ethical obligations that accompany these new types of transactions. I agree with you, always use an experienced short sale professional. Andrew watching a seller pick an agent that has no idea of what they are doing in a short sale is one of the most frustrating experiences. It amazes me how many seller’s out there do not do any research regarding the Realtor they are hiring. It makes me sick! Bill, I always crinch when I read “approved short sales”. I just wrote a blog about approved short sales on AR and why there is a caveat. More importantly, I understand your frustration and I would certainly call the listing agent’s broker first before I would proceed further. There is a law suit waiting to happen. Hi Petra – Often times when you see approved short sale in MLS what the agent is trying to communicate is that a price has been approved. It would be impossible to have a complete approval without having a buyer in place. My case was completely different as there was no short sale approval of anything. It was a blatant misrepresentation. I could have gone on and on in my article about this agent. She is the type of agent that gives our industry a bad rap! Bill, in a word, ouch! As far as what to do, I would start by sending a link to to this article to the managing broker and owner of the other company. I would simply tell them that out of professional courtesy you felt it was your duty to let them know they have a walking/talking liability at their company. It is unfortunate, but many agents are just like this one. So pay attention Metrowest Mass! Hire your friend and this could be you. Hire Bill, and you’ll be in great hands. Joe this person was absolutely amazing in a bad way! I am going to be updating my short sale story at some point in the near future. I really appreciated your post. As an experienced short sale agent in Massachusetts, I see instances where mistakes made by realtors negatively impact their clients, in a serious way. I’m glad that you pointed out what you would have done/what should have been done. It’s nice to network with other short sale agents! This happens all of the time. We get the agents who make lower than lender approved sales prices and get upset because the seller will not accept the offer. We have had quite a few agents attempt to contact the lender directly. Dowell Taggart we both know the lender does not own the property so it makes no difference if the buyer is upset or not. Advertising a list price that has not been approved as “approved” is a violation of the code of ethics – completely different situations. Real estate in general sure has changed. We are having many appraisal issues here in Atlanta. How is it in your neck of the woods ? The majority of the transactions I am dealing with are now distressed properties which is not at all where I used to think my real estate career would take me. The agents being unaware of how to market and deal with offers in distressed properties is astounding. I would love to see some legislation regarding who is able to represent short sales. I am thankful for the education that CDPE offers. 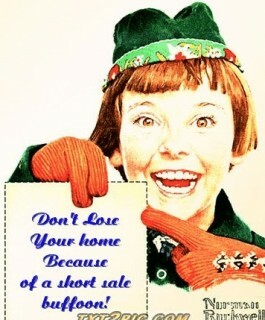 I have been dealing with short sales since before they were the norm and it is not just like selling any house. I don’t sell commercial because I don’t feel I can really represent my client in it so why do agents try to deal with short sales when they are unfamiliar with the process? Steve it really is bothersome when you see agents getting involved with a transaction with which they have no expertise. It really makes our industry look bad when you have Realtors who don’t know anything about short sales listing properties and handing out some of the worst advice imaginable. A few days back we converesed about short sale seller accepting a lower offer than our offer. I have found that the seller did accept our offer of $20,000.00 more but the real estate agent never sent our offer to the bank. Wasn’t she obligated to present it to the bank since the seller approved it? I consider myself a pioneer in the short sale arena, completing my first in 2003 when practically no one had heard of a short sale. I spent a long time making a fantastic system to get short sales to get approved and then all the sudden the game began to be come popular and everyone wanted in. I cannot stand agents who took a stupid class for a few hours and are now “experts”. Contrary to a lot of agents I think the CDPE course is a scam to which a lot of money was made and many more sellers were harmed. The pre-approved deals are usually not pre-approved with the exceptions of the HAFA deals which will still take time. Occasionally I have been able to get a buyer pushed through in less than 3 weeks if they are a backup offer but that is rare. I totally agree with the pre-approval being a scam a majority of the time and Bill you really should have filed an ethics complaint on this agent. Having said this there is a very simple and effective way to actually get a short sale pre-approved and speed up the process and many times even get the bank to tell you what price they need all while fulfilling your obligations to the sellers and all parties involved in the deal. Think outside of the box, get investors involved prior to MLS listing and use their low offers to you and your sellers advantage. I won’t give away my whole trick but it has given me a legit and bombproof way to achieve a 97% success rate for my sellers.